Posted on Wed, Apr 21, 2010 : 2:12 p.m. Anticipation. Preparation. Responsiveness. Enjoyment. Those are parts of foraging. The fun and the work, the seasonal process. 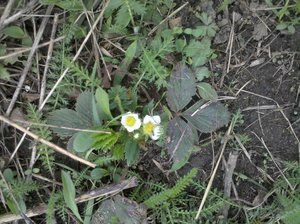 The wild strawberries have started to bloom. Imagine the experience of biting into a fresh juicy soft berry, the mix of flavors: a little citric, a bit of sweet, the mouth feel of soft flesh that does indeed yield easily to the tongue. The exciting dense smell is released, the bright red color proven. The cultivated strawberries we grow are a treat. Wild Michigan strawberries are a minor miracle. The small wild berry is a single bite, a tiny jewel of flavor packed so densely it is a sharp surprise. A first berry you eat is enough for a moment, until you want more of the experience. They’re coming sooner than you might expect. In your walks, look for the distinctive three leaves, and note where they are first beginning to bloom. You’ll want to monitor the fruit development so that on that one perfect day when they are ripe you will be ready and eager to return to the site and enjoy. Start the preparation. The flowers are coming on, the fruit won’t be far behind. Identify the plants (with the white flower) and their location now. The fruit will be a little more hidden next month when you want to find the ripe berry. But when will they be ripe? It depends on the weather, it depends on location, it depends on the plant. The window of wonderful perfection is very short, just a day or two, compounded by the competition for this wonderful wild treasure. The deer are also waiting, rabbits, even mice I suspect. You are even competing with the slugs who can spoil your pleasure when they have nibbled a hole in the luscious fruit. You must remain ready and able to meander to the spot (did you think I was going to say rush?) and enjoy that perfect moment. Once the flowers appear, it is only a matter of time and careful waiting. The thing about wild strawberries is that they don’t store well, they don’t freeze well, and I can’t even recommend that you take them home to share with the people who refused to come with you. The only really good way to enjoy them is right then and there, in the field, unwashed, from plant to hand to mouth. But the anticipation begins when you spot that little white flower. A thrill of desire and eagerness, a bit of preemptive salivation. The waiting has begun. Linda Diane Feldt is a local Holistic Health Practitioner, writer and teacher. She will offer a free class this Thursday, April 22, on how to assemble an herbal first aid kit using both wild and preserved items. The class will be from 7-8:30 at Crazy Wisdom Bookstore. While pre-registration through the People's Food Co-op is preferred, feel free to drop in. Linda Diane can be reached at ldfeldt(at)holisticwisdom.org, follow her twitter feed or check out her website. Thu, Apr 22, 2010 : 10:07 a.m. I always see the plants, but I think the little critters get the fruits before I can. Thu, Apr 22, 2010 : 8:27 a.m. There are some wild strawberries that missed the part about flavor. But they are few and far between. If it looks like a strawberry, smells like a strawberry, has three leaves, and a smaller and sometimes pointier version of a red strawberry, it will be a strawberry. Sorry if your plants are those that don't have it. But my impression is that some years the taste may be off on a patch and the next year be amazing again. Try it and see. Thu, Apr 22, 2010 : 7:37 a.m. I have some random strawberry looking plants growing in a weedy patch of lawn in my backyard. The strawberry fruits are very small, but have no flavor to speak of. Is it wild strawberry?